Delia has long been the person we turn to for stress-free Christmas celebrations. 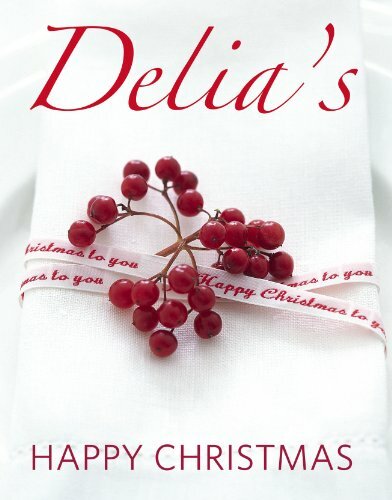 This year, she celebrates 40 years of writing recipes and brings you Delia’s Happy Christmas - the definitive guide to all aspects of cooking for Christmas. This cookbook will help you to plan your Christmas festivities to the very last culinary detail, acting as an invaluable Christmas organiser from reminding you to make your Christmas pudding and chutneys in November to giving you a crucial countdown for the Last 36 Hours. Delia’s Happy Christmas will give you 150 recipes, including 100 new recipes and 50 much-loved classics, plus menu plans and shopping lists, illustrated with glorious full-colour photography. There are recipes for all your favourite traditional dishes - Delia’s Classic Christmas Cake recipe has been in print for over 40 years and has never been bettered, but Delia has also created Chestnut Cupcakes recipe to satisfy modern tastes. Of course there is Delia’s foolproof recipe for a Traditional Roast Turkey and all the trimmings, and The Only Traditional Christmas Pudding as well as ideas for parties, boxing-day suppers, vegetarian feasts and what to do with leftovers. Organisation is the key to success. If you follow Delia’s Christmas calendar, you will be sure to create a very special Christmas. And even if you don’t, there is always Delia’s The Last-Minute Christmas – a chapter for those who leave things to the eleventh hour. Wondering why English food was so awful in the 1960s set Delia off on a quest to learn about it and educate people in how to cook their traditional dishes, a mission that, for the past 33 years, has made her the nation’s favourite cook. Born in Surrey and brought up in Kent, Delia left school at 16 without a single O-level. She first tried her hand at hairdressing, then being a shop assistant and working in a travel agency. But, at 21, determined to learn how to cook – perhaps partly to impress a new boyfriend – she found her metier and started work in a tiny restaurant in Paddington, The Singing Chef. Washing up and waitressing finally led to her being allowed to help with the cooking and she began to wonder why, if French food was so good, English food was so awful. This curiosity encouraged Delia to read English cookery books in the Reading Room at the British Museum, trying out the recipes on the Harley Street family with whom she was lodging. In 1969 Delia was taken on as the cookery writer for the Daily Mirror’s new magazine, where she met her future husband, Michael Wynn Jones, who was Deputy Editor. Realising that her recipes could fill a gap in the market, Delia brought out her first cookery book in 1971: How to Cheat at Cooking. In 1972 started writing for the Evening Standard, a partnership that continued for 12 years. This was followed by a successful column for the Radio Times, which Delia wrote until 1986. In 1973, Delia began her illustrious TV career with Family Fare, a new series for BBC 1 that ran until 1975. During this time she also wrote Recipes from Country Inns and Restaurants (1973) and The Evening Standard Cookbook (1974). Frugal Food followed in 1976 and, a year later, Delia Smith’s Book of Cakes. Realising that her aim was to educate people, taking them back to basics and covering classic techniques, Delia approached BBC Further Education with an idea for their first televised cookery course. Delia Smith’s Cookery Course: Part One was published in 1978 to accompany the series, followed, over the next two years, by Part Two and Part Three, the beginning of a publishing phenomenon. A hardcover omnibus edition of all three books, Delia Smith’s Complete Cookery Course, was published in 1982 and has sold over 2,000,000 copies. This was followed in 1989 by an updated and fully illustrated hardcover edition, Delia Smith’s Complete Illustrated Cookery Course, which has sold 900,000 copies. In 1992, BBC Books published the first mass-market paperback edition of the Cookery Course, which has sold 870,000 copies. Nothing better illustrates the breadth of Delia’s following than the need for and success of these three different editions. ? ?In 1985 Delia wrote a collection of recipes for the single person, One is Fun! which became a BBC Pebble Mill television series. The book has sold over 650,000 copies and been translated into German, Swedish and Italian. Delia returned to television in 1990, this time to help us through the daunting task of cooking for Christmas. Delia Smith’s Christmas, has sold 1,500,000 copies and the series is repeated each Christmas. The 1990s were to prove hugely successful. Delia Smith’s Summer Collection, published in May 1993 and accompanied by a 10-part BBC2 television series, broke all her previous records, selling over 1,600,000 copies. In autumn 1995 Delia Smith’s Winter Collection was published, together with a 12-part BBC2 television series. By January 1996, it had sold 2,400,000 copies, and became the fastest-selling book on record. It has also appeared in America. October 1998 saw the publication of Delia’s How to Cook: Book One, which has sold over 1,690,000 copies. In this book, and its 10-part BBC2 television series, Delia went right back to the roots of cooking. Delia’s How to Cook: Book Two, published in December 1999, has so far sold over 1.2 million copies, while Book Three, published in December 2001, has sold over 800,000 copies to date. A year later, Delia’s Vegetarian Collection was published, with new recipes reflecting changes in modern-day cooking. It has sold nearly 289,000 copies. ? ?More recently, Delia decided to collect various recipes – each focusing on a single ingredient or type of dish – into The Delia Collection. Soup, Fish, Chicken and Chocolate, were published in autumn 2003. The following year, Italian and Pork were added. Delia’s latest book has a different theme from the rest: inspired by her new kitchen garden at home in Suffolk, Delia wanted to create a book that told people how to grow their own fruit and vegetables month by month, incorporating them into seasonal recipes. Written by her friend, Gay Search, Delia’s Kitchen Garden is the result. In early 2008, Delia published Delias’ How to cheat at Cooking, an echo of her original book in 1971, featuring qualty bought ingredients to make life easier for the busy cook. Although the book caused a stir, it proved yet again that Delia is always in tune with the zeitgeist, recognising that even with busy lives people want to eat well and actually prepare a meal, rather than rely on ready meals and takeaways. In early 2009, Delia published Delia’s Complete How to Cook, bringing together the three earlier volumes in one omnibus collection. Delia is also known for her spiritual books. Having been baptised in the Church of England, she attended a Methodist Sunday School, a Congregationalist Brownie group and later a Church of England youth group. At the age of 22, however, she decided to become a Catholic and took instruction. Her first two short religious books, A Feast for Lent and A Feast for Advent (both published in 1983), are readings and reflections for these seasons. In 1988 Delia took on the much larger challenge of writing a full-length book on prayer, A Journey into God. These books are still actively selling, with all three titles sold to US publishers. Delia’s humanitarian values have also seen her raising money for charity. In 1980 the Food Aid cookery book was her contribution to the Band Aid charity, while in 1997, Delia’s Red Nose Collection raised over £1,250,000 for Comic Relief. Four years later, Dawn French and Jennifer Saunders insisted that she repeat this success. Delia’s Chocolate Collection again became an instant bestseller, accompanied by a five-part series of hilarious TV ‘shorts’ in which Delia revealed her self-deprecating sense of fun. ? ?One of Delia’s other great passions is football. She has been a supporter of Norwich City Football Club for over 25 years and, in November 1996, became a Director of the club. Three years later, Delia’s Canary Catering opened its doors to the public and now has five different restaurants as well as bars, lounges and conference rooms, serving ‘Delia’ food all year round. From 1993-1998 Delia worked as a behind-the-scenes consultant for Sainsbury’s and, in May 1993, she and Michael Wynn Jones launched Sainsbury’s Magazine.